There is an extraordinarily bullish case that agrees with your scenario that 2009 as the bottom. One is that the bear market from 2000 to 2009 looks like an exquisite Elliott ABC 4. Which would mean we could be in 1 of a 5 impulse wave up. The other is Gann’s Master Time Factor, the 60 year cycle. 60 years ago the US was near historically low interest rates with historically high debt levels. We were in the Korean War. Europe and Japan were in shambles. People were fearful of falling back into a depression. Sound familiar? But somehow the stock market just kept going up as it “knew” we were embarking on 15 years of strong growth, mild inflation, and gradually increasing interest rates. That is very interesting historically rhyming poetry to me. The factor that does not agree with you is that commodities topped in 1951 corresponding with 2011 and fell 30% and stayed flat for 15 years thereafter. The previous is so hard to believe it gives strong contrarian credence. Of course, even if we are in a 1 up, it leaves room for a double bottom 2 of the 2009 lows. Ref the sunspot cycle and S&P cycle above. I think the drop from the 2000 high in sunspots from above 400 to around 25 corresponds to the 2011 drop from above 200 to around 25. Even though the sunspots rallied back to a double top, the 2000 bear market continued. So I guess I’m thinking that 2 down beginning is imminent. Kudos. You do great pioneering research on this matter. This forecast is very compelling, as usual. If 2009 was indeed the secular stocks nominal low, then I think inflation will have to be VERY high in order to bring real (inflation-adjusted) stock prices low enough to cause the sort of despair normally associated with secular bull conclusions. Of course, very high inflation does fit well with your other analyses. If the Dow/Gold ratio is to reach 1:1 (as it has in the past), then gold will have to reach at least $6600/ounce… My personal estimation is $8800. is there a site where I can get the sunspot (geomagnetic) data* in excel format so i can graph and compare with some market indices? Hi Lawrence, this is what you get. It’s not excel. The relationship between solar minima and stock market crashes has been bugging me since I saw the above chart. I googled it and your article came up high on the list. According to the chart, the SSN solar minimum was Oct 1986, not July 1989. 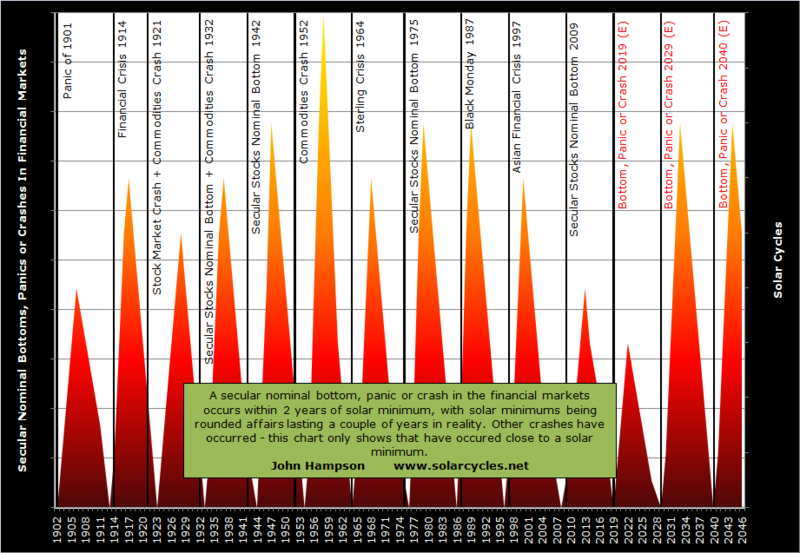 I point this out because, on the chart, the crashes all appear to have occurred approximately one year after the solar minimum, with the exception of May 1976. I appreciate the sample size on the chart is small, but I wonder where you sourced the data for the solar minima? Could it be that the correlations are “tighter” than your initial appraisal suggest? I’m no mathematician, but I believe it possible that there is a harmonic that links the larger grand minima (Dalton etc. ), planetary tidal forces and Schwabe cycle durations (that impacts on your commodities/ shares cycle) that is yet to be identified. Unfortunately, I don’t have the brain power to compute it. Thanks TDL. Wikipedia was my source, I believe, and having checked I just made an error there – 1986 it was, not 1989. The others appear correct. If you can produce something visual to cover the harmonic you have in mind, I would be interested to see it.